This book-by-book broad overview of the Bible analyzes the structure of each book, lists its special features, and suggests further reading. 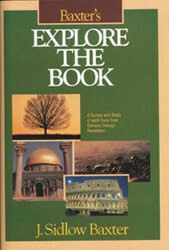 Explore the Book is not a commentary with verse-by-verse annotations. Neither is it just a series of analyses and outlines. Rather, it is a complete Bible survey course.No one can finish this series of studies and remain unchanged. The reader will receive lifelong benefit and be enriched by these practical and understandable studies.Exposition, commentary, and practical application of the meaning and message of the Bible will be found throughout this giant volume. Bible students without any background in Bible study will find this book of immense help as will those who have spent much time studying the Scriptures, including pastors and teachers.Explore the Book is the result and culmination of a lifetime of dedicated Bible study and exposition on the part of Dr. Baxter. It shows throughout a deep awareness and appreciation of the grand themes of the gospel, as found from the opening book of the Bible through Revelation.